The nature of this article does mean that there will be some pictures which are quite graphic and that we will be discussing a subject that some may find distasteful; PLEASE STOP READING NOW IF YOU ARE A SNOWFLAKE. Following on from yesterday's review of the browning x-bolt I'm dedicating a whole post to a lesson related to firearms and their use for getting wild food in the UK, rather than trying to shoe-horn it into yesterdays post. We'll be discussing terminal ballistics which is the term used to describe the path of a projectile once it has hit it's target. If we are planning to harvest wild game as part of our practice of bushcraft then we need to understand this so we select the right weapon to kill something for the pot. The nature of this article does mean that there will be some pictures which are quite graphic and that we will be discussing a subject that some may find distasteful; PLEASE STOP READING NOW IF YOU ARE A SNOWFLAKE. It's important if we are going to take a life to fill our freezer that we do so as humanely as possible and in accordance with local laws. I have written about archery here before and why I have never dedicated any significant amount of time to it's practice for the simple reason that it is not legal to hunt deer in the UK with bow and arrow so it practising never seemed like a good use of my time. 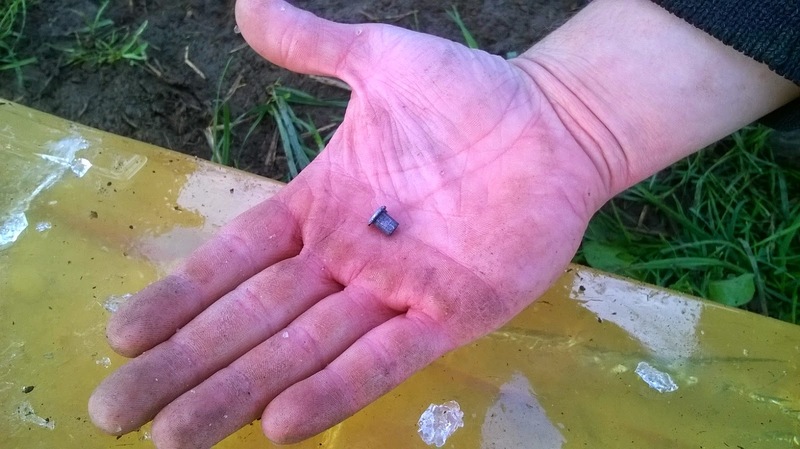 So this post will focus on the terminal ballistics of rifle bullets and how they affect our quarry. 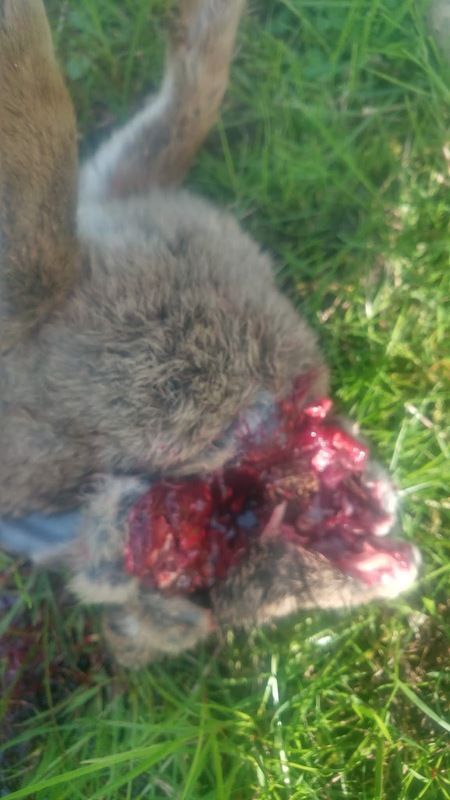 When we discharge a rifle at a deer, rabbit or anything else that we intend to kill for the pot the projectile doesn't stop moving once it hits our target, obviously it penetrates it and causes traumatic damage and blood loss leading hopefully to a quick or instant death. The path of the projectile after it's first impact with the target and it, or it's pieces coming to rest, the projectiles terminal ballistics are the topic of todays post. To set the scene watch this video to get an understanding of what happens when bullets strike their targets. These videos are quite old but show in great detail the effect of modern and antique firearms on ballistic gelatin and bone. Ballistic gelatin is made to mimic flesh in tests and so these videos are indicative of a bullets behaviour once it strikes a live target. One of the Browning X-bolts featured in yesterdays review is chambered in the same 5.56 mm calibre for the M16 that is tested in this video, the calibre is known as .223 in civilian circles. The video is an old one but is does show perfectly what is meant by terminal ballistics and compares quite effectively the damage caused by modern rifle bullets compared to frontier era pistols and rifles which might also be of historical interest to bushcrafters. To put what you have just seen into perspective and relate it to gathering food the legal minimum calibres for shooting Chinese water deer and muntjac (the two smallest deer species in the the UK) in England and Wales is .220 with a minimum bullet weight of 50 grains and minimum muzzle energy of 1000ft/lbs. For the larger species of deer the minimum is .240 and a minimum muzzle energy of 1700ft/lbs (there is no mandated minimum bullet weight). 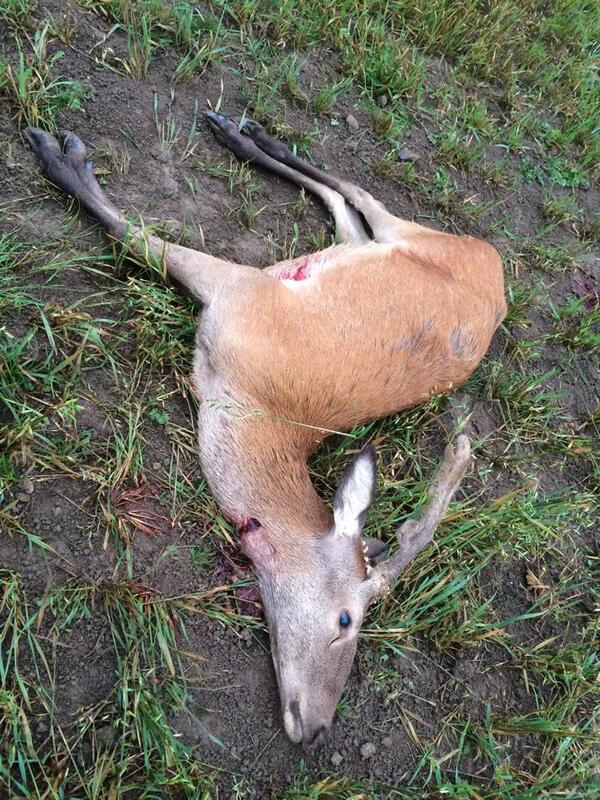 This guideline exists to ensure that deer are only shot with calibres that can kill them humanely. It is true that smaller calibres can kill deer, especially with a well placed shot but the welfare of your quarry is paramount and you should never be tempted to use smaller calibres or inappropriate shotgun loads for shooting deer. Shotguns loaded with non spherical slug or AAA shot can be used to shoot deer in England and Wales but slugs require a section 1 firearms licence and good reason to posses and AAA is really only a loophole to allow farmers to shoot deer if they are doing severe damage to crops and they don't have access to a rifle. 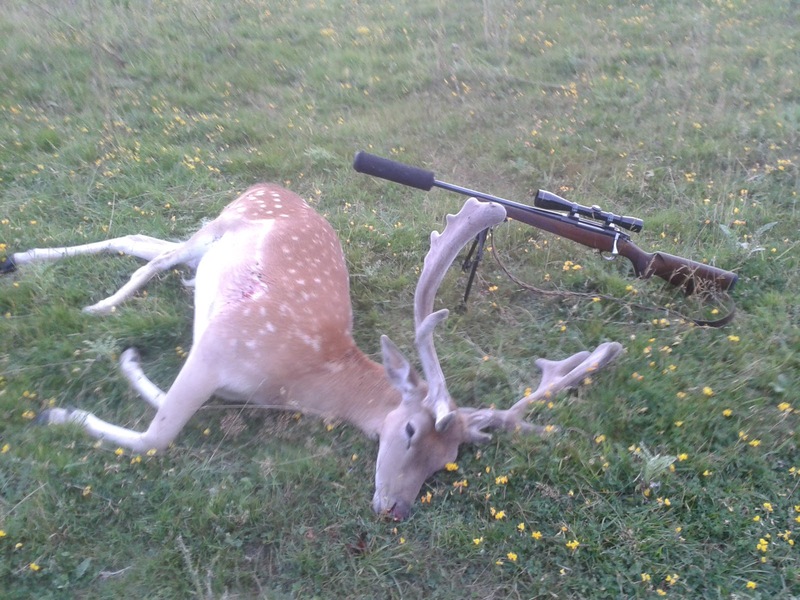 I would strongly recommend AGAINST using shotguns on deer unless it is to dispatch an already immobilised or trapped deer that can't easily get away and then only at very close range, even AAA shot which is large by most game shooting standards only carries a few ft/lbs of energy per individual shot and is not capable of killing or even severely wounding deer except at extreme close range. One of the reasons for this lack of wounding capability is that the shot (which is actually a similar diameter to a .223 rifle round) does not deform on impact. The deformation of a rifle round is what allows it to transfer the maximum energy to it's target and kill it humanely. In fact rifle rounds for use on deer must be 'expanding rounds' that is they are designed to deform rapidly on impact with the target. You can see the ammunition here on the left has plastic orange tips and on the right has slightly hollow points. The ammunition in the centre is NATO Ball ammunition with a full metal jacket. The other rounds are designed to deform on impact with soft skinned mammal targets and impart maximum damage to cause a humane kill. The ammunition shown in the video was all non expanding ammunition in that it was either fully jacketed or solid lead which will deform but only when it hits something quite solid like bone. The rounds designed to expand rapidly are generally partially jacketed in copper but split open and rapidly deform on impact, an exposed lead tip, un-jacketed hollow point or plastic tip cause the bullet to rapidly open up bursting the copper jacket and smashing open the bullet to cause maximum shock and blood loss. 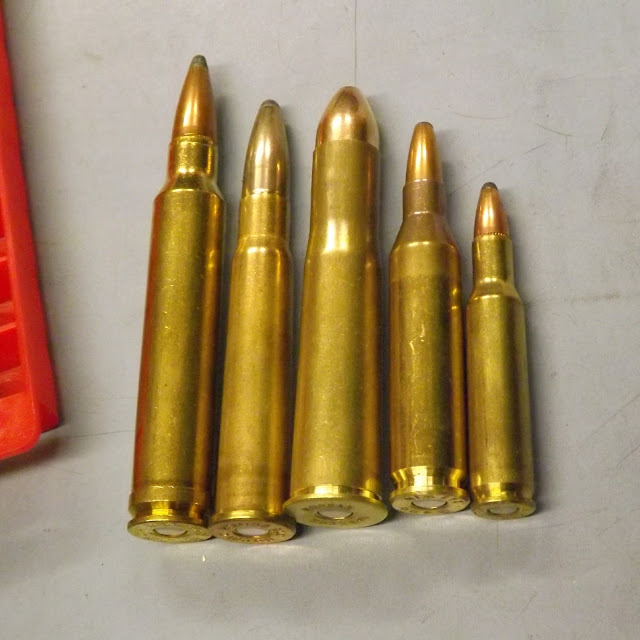 The rapid expansion of these bullets causes catastrophic temporary wound cavitation even more extreme than what you saw in the video but the bullets do not penetrate as far as they deform and fragment so quickly. The permanent wound cavity of a .243 soft point rifle bullet. 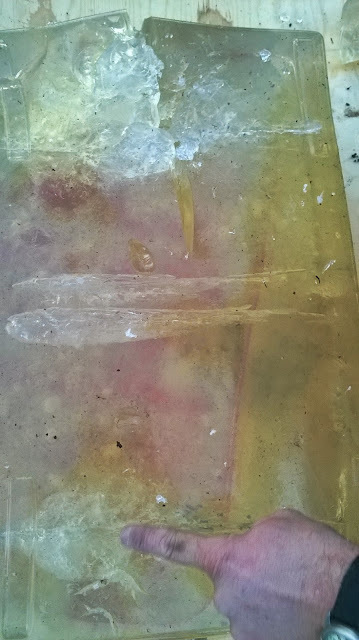 You can see the lead fragments at the end of the individual wound channels. A close up of the farm end of the wound channel. bear in mind that on a live target this expansion would start at the bullet strikes the skin and passes through the first layers of meat, fat and bone before entering the chest cavity and encountering softer organs and structures, so wounds to live targets do not look exactly the same. Comparing the wound channels of different projectiles, standard .22 rim fire hollow points on the left and expanding .243 rounds on the right. The rim fire rounds although hollow point do not do nearly the same damage as the more powerful centre fire cartridges as they do deform slightly but do not break up or carry as much energy. Another comparison of permanent wound cavity this time a .25-06 at the top, .22 rim fires in the centre and .243 at the bottom. You can see the .25-06 has caused temporary cavitation large enough to split the gelatin open completely. 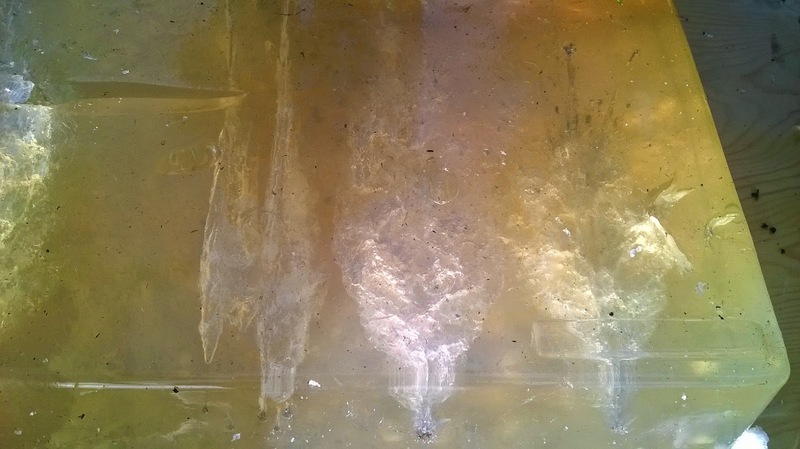 The temporary wound cavitation shown so clearly in the slow motion video isn't obvious looking at the gelatin afterwards except in the case of the 25-06 round where it has split the gel open but that shock as it is transferred to the target is often although not always enough to knock an animal to the ground even if it doesn't kill it instantly. To ensure a humane kill though this energy needs to be directed at a vital part of the animal where the wound caused will kill quickly and humanly. 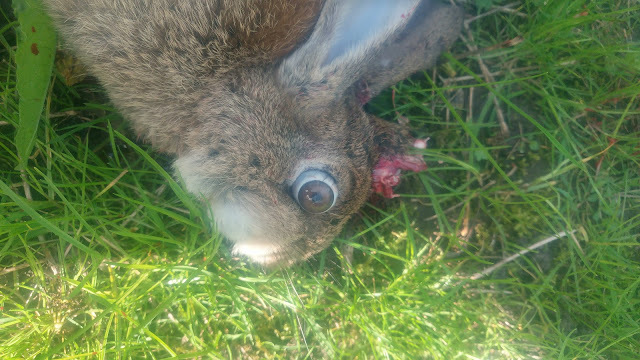 In small game a head shot is often preferred and the rapid bullet expansion through an animals skull is always going to be fatal. Entry wound of a 55 grain hollow point .223 round on a rabbit. Exit wound on the same rabbit; you can see that the bullet has expanded significantly and the temporary wound cavity was larger than the animals head causing the destruction you see here. There is no doubt though that it was a humane kill. Just because bullets are so incredibly damaging doesn't mean that they are magically able to kill any quarry or that a head shot is always successful like in video games and movies. You need to carefully select a suitable calibre and type of ammunition for your quarry and be aware of the performance of the round so you can safely and humanely select your shot placement to ensure you achieve a humane kill. Fox; rim fire are acceptable at close range and if you are taking head shots but for mid to long range shots centre fire rounds such as a .220 swift, .22-250, .223, .222 up to things like the .243 and .260 are great for foxes. Muntjac and Chinese Water Deer; although .220 centrefire rounds are legal on these small deer I am unconvinced of their stopping power and prefer something larger such as a .243 Winchester. Larger deer; .243 Winchester, 6.5x55 mm, .308, .270 etc... for red or large fallow I would prefer something larger than .243 (6.5x55mm would be my first choice) although it will do the trick and is legal. Temporary wound cavity; the shock wave caused by the energy transfer from the bullet causing the surrounding tissue to stretch and expand, due to the elasticity of flesh this will return to it's former shape once the energy has dissipated but the act of expansion may tear the flesh or split it open. Bones do not have the elasticity of flesh and will break, and may shatter, under the influence of this energy transfer. Permanent Wound Cavity; this is the permanent wound caused by the passage of the projectile, it's pieces and potentially also of bone fragments. This will be a permanent penetrating portion of the wound where flesh has been torn away, bones broken and displaced and will not return to it's original shape. The permanent wound will bleed and will extend into the organs and internal structures of your quarry. You have seen these permanent wound cavities in some pictures here and that is the result of a bullet wound either killing through rapid blood loss by a shot to the heart and lungs or immediately through shock at the destruction of a vital organ like the brain or heart. So that is the gruesome reality of putting meat in the pot as a buschrafter. Traps are an alternative in some cases and air rifles are probably the most versatile weapon for gathering small game such as squirrels, pigeons and rabbits and do not have the same restrictions and licence requirements as section 1 and 2 firearms but if you want to go after deer you will need to use the larger legal calibres. Even your interest in buschraft and primitive skills doesn't allow you to use ancient methods to hunt although you can skin and prepare deer with flint tools to practice your primitive skills but must hunt and kill them according to local laws. butchering a red deer with flint tools.